The Two-Regime-Pricing (TRP) model developed by Bühler, Korn and Schöbel (2004) is an important bridge between two strands of the literature of commodity futures pricing. It incorporates both the notion of a convenience yield” and the idea of pricing based on the underlying spot price process. This work uses the TRP model and applies the findings to the pricing of industrial metal futures. In detail, the purpose of this study is to price a variety of futures contracts written on the traded industrial metals Aluminium, Aluminium Alloy, Copper, Lead, Nickel, Tin and Zinc using the TRP model and to analyze ist strengths and weaknesses in doing so. Given the spot price specification, a bootstrap maximum likelihood estimation is performed to determine the model parameters. Given the estimation results, the out-of-sample performance of the TRP model is compared to two benchmark models in the literature. In addition, the behavior of the theoretical futures prices is matched to metal futures properties observed in the market. By outlining the statistical challenges in estimation and forecasting in much detail, this work is valuable for researchers and academics in the field of derivatives pricing. Textprobe: Chapter 3 Statistical Properties of Metal Prices: 3.1 Data set: The empirical study uses twofold data sets of London Metal Exchange (LME)’s prices provided by Thomson Reuters’s Datastream platform as well as daily U.S. Treasury yield rates. All time series were made available on a daily basis until 4/13/15. The rst data set contains of daily closing cash prices of Al, AlAl, Cu, Pb, Ni, Sn and Zn. Figure 1 depicts the evolution of the respective Metal Cash prices over time. Obviously, most of the examined metals experienced a regime shift during the observation period, which indeed does not go in line with the assumption of mean-reverting commodity prices. In the period before 2000, the prices show a more or less stable mean-reverting pattern. However, starting in 2004/2005, metal prices rose tremendously, which is foremost due to the economical emergence of developing countries, such as Brazil, Russia, India and China (Nappi, 2013). Unsurprisingly, the Financial Crisis of 2008 has lead to a subsequent drop in metal markets. In the aftermath of the Financial Crisis, figgures again rose up to levels surpassing the 90’s prices. For Cu, Pb and Sn prices at the end of the last millennium approximately tripled until 2015. In the late 2000s, figures again settled, however, at a greater level with increased variability. Figure 2 shows the evolution of metal prices starting in 01/01/2009. Now, the assumption of mean reversion in metal prices is more reasonable. In order to capture the mentioned regime shift in my analysis, the data prior to 2009 will be excluded. Thus the data set of each of the metals comprises to 1638 observations. Table 1 provides a brief summary statistic of metal spot price returns. On average, the return of all metals was positive, even summing up to approximately 10% for AlAl and Cu. The estimated annualized volatilities of the price returns vary between approximately 21% and 33% across the different metals. Except of AlAl and Cu, all of the returns are left-skewed. A leptokurtic distribution can be inferred for all metals, as kurtosis is at least 4.7. The second data set comprises continuous futures prices written on the mentioned industrial metals, summing up to 89 time series. In contrast to other exchanges, LME offers their clients daily, weekly and monthly settlement dates for futures contracts of up to three months, six months and over half a year, respectively. The time series of prices analyzed is a continuous moving source by Datastream, where the nearest traded deliverable contract forms the reported futures price. For example, consider the case where the actual date is 8/17/15 and the 12 and 13-months futures contracts are maturing at 8/17/16 and 9/16/16, respectively. Datastream reports the 8/17/16 contract’s price as the continuous twelve-months futures price until 9/7/15 - afterwards the continuous twelve-months futures price refers to the contract maturing in September 2016. Table 2 summarizes the continuous futures in scope. Again, all prices were made available on a daily basis in the observation period 01/01/2009 - 4/13/15. As mentioned in section 1, commodity futures markets exhibit both periods of backwardation and contango. Table 3 presents summary statistics of backwardation for metal futures contracts. It depicts the average, maximum and minimum bases of the respective metal futures. Additionally, the fraction of time, futures prices were backwardated, is presented. On average, Al, AlAl, Pb and Zn were in contango, which can be inferred from an average negative basis. For contracts of up to 18 months, futures of Cu and Ni were on average in contango and longer term maturities were backwardated. Except for one and two-months contracts, the mean term structure of Sn was also backwardated. The proportion of time being in backwardation varies substantially across metals, e.g. whereas Al contracts are at most 10% of the time in backwardation, bases of Cu are at least 30% of the time positive. The last data source are daily constant-maturity yield rates, provided by the U.S. Department of Treasury for maturities of one, three and six months, as well as for one, two, three and five years. In order to obtain yields matching the maturity of the examined futures contracts, following interpolation rule was applied: […]. 3.2 Stationarity and Mean Reversion: A crucial assumption of the TRP valuation model is mean reversion of both logarithmic spot and futures metal prices. The notion of mean reversion is closely related to (weak) stationarity in a statistical sense. Indeed, a time series can be shown to be stationary and hence mean-reverting, if it does not posses a unit root. Therefore, a broad range of authors use statistical unit root tests to draw inference that commoditiy prices behave mean-reverting. Besides a test based on hedging of option contracts, Andersson (2007) performs four statistical unit root tests to detect mean reversion in 280 different commodities. In a similiar fashion, Barkoulas, Labys and Onochie (1997) performs unit root test to analyze long term dependencies in commodity markets. Table 4 provides the results of two different stationarity tests on the data set of logarithmic spot prices. The first test is the augmented test by Dickey and Fuller (1979, hereafter ADF), which tests the null hypothesis of a unit root process. The test by Kwiatkowski, Phillips, Schmidt and Shin (1992, hereafter KPSS) reverses the idea of Dickey and Fuller and states stationarity as the null hypothesis. I perform tests of both the unit root hypothesis and the null of stationarity, without regarding them as complementary. Caner and Kilian (2001, p. 655) mentions that ‘this practice will tend to result in spurious acceptances of the unit root hypothesis’. Therefore, inference can only be drawn cautiously. The test variants of a constant term but without a deterministic time trend are applied, as no clear time trend is observable in the data. As mentioned by Hall (1994), I estimate the lag length in the ADF test based on a combination of the information criteria proposed by Akaike (1998), Schwarz (1978) and Hannan and Quinn (1979). […]. 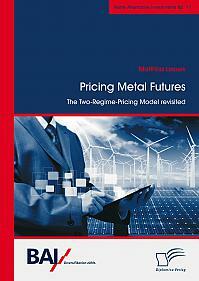 4 Pricing Metal Futures: In this section, the TRP model by Bühler et al. (2004) of pricing commodity futures contracts is introduced. Firstly, the model is discussed in detail and compared to other models of pricing futures contracts. Secondly, the model parameters are estimated and lastly, the TRP model is used to price an extensive data set of industrial metal futures. 4.1 TRP Model Setup: Bühler et al. (2004) develop a continuous time partial equilibrium model of oil prices. The logarithm X(t) of the commodity price S(t) at date t is given exogenously and assumed to be driven by an OU process of the form: [...]. 4.2 TRP Model Analysis: In this section, the TRP is analyzed, whether it is capable to capture the documented characteristics of metal spot and futures markets. [...]. The authors assume a stationary OU-type commodity spot price. The special cases of equation 4 and 5 indicate, that the only possible source of non-stationarity in futures prices is the spot price itself, therefore futures prices in the TRP model also are stationary. As already mentioned in section 3.2, this might be reasonable for part of the examined metals. Therefore, I expect the pricing performance of the TRP model to be better for metals, for which evidence of mean reversion was partially drawn, i.e. AlAl, Cu, Pb and Zn. Backwardation often occurs in commodity futures markets. A reasonable pricing model should therefore capture this feature. The TRP model offers an endogenous term-structure of futures prices. Depending on the current spot price, it is able to explain situations of contango and backwardation. If the spot price is relatively low, compared to its long term mean value, it is optimal for the investors to buy and store the commodity. Hence, arbitrage is possible and futures prices are determined by Cost-of-Carry resulting in an upward-sloping term structure. For high spot prices, it is not worthwhile to buy and store the commodity as the price is expected to return to its lower long term mean level. Thus arbitrage cannot be exploited and futures are priced solely based on the expected spot price at the futures’ maturity. Hence, backwardation is present in the commodity market, as the commodity price is expected to decline. The evolution of the theoretical term structures according to the TRP model are visualized in figure 4. The term structure is downward-sloping for high spot prices and upward-sloping for low spot prices, which is in line with market observations. Seit 2015 ist Matthias Lassak wissenschaftlicher Mitarbeiter und Doktorand an der Frankfurt School of Finance & Management. Seinen Bachelor-Abschluss erhielt er in BWL/Banking von der Dualen Hochschule Baden-Württemberg in Kooperation mit der Sparkasse Hohenlohekreis. 2015 schloss er das M.Sc.-Programm in Economics and Finance an der Universität Tübingen ab. Während des Master-Studiums arbeitete der Autor als Dozent an der Hochschule Heilbronn und hielt Vorlesungen in Vertriebsmanagement von Finanzprodukten und Investition & Finanzierung. Zusätzliche praktische Erfahrung sammelte er bei der Credit Suisse in Zürich in den Bereichen Liquidity Risk Management und Regulatory Liquidity Reporting.